Topic: Asking for help, for a second time! Re: Asking for help, for a second time! The action is perfect. It stays open strongly and opens easily. Heinnie Haynes. Very good knife. See the long thread on it. The regular one is awesome too, so don’t think it isn’t. Jazz, did you happen to weigh them? Glad to hear you’re liking it Jazz. Did you notice the little ramp up on the spine of the g10 when it meets the jimping on the thumb ramp? It’s a subtle change but I think it helps the ergos a bit. No, but now I do. Very nice. I'm thinking of this one. How is the detent when open? Does it feel secure, like the UKPK? Topic: Anyone else got the shakes?? Re: Anyone else got the shakes?? I need some ointment for my Dragonfly wharncliffe itch, I tell you what. Welcome, bro, and I really like your Dragonfly scales. Is that just the green G10 one? In the pic I see lines. Probably just the pixilation or something. You'll get used to the blade widths after a while. Now that I use Spyderco, all other brands feel weird to me. Salt 2 wharncliffe, if that size is okay, or why not a regular Rescue? The serrations run to the tip, and will catch like a wee hawkbill on sails, etc. for slicing into. My original black G10 model is perfect, with perfect action, and is one of my favorite whittling knives. I really wish I would have bought a carbon fibre one too. Patiently waiting for that red beauty. Gsg9 - Very nice pic. Topic: Does anyone else wish for a standard scale color other than black? Re: Does anyone else wish for a standard scale color other than black? I like the black, but hey, how about a goldenrod Delica wharncliffe? All the stuff from the 80’s and 90’s when I didn’t know, or even know of Spyderco’s cool knives. Yes. And then they reveal something new and exciting we never had a clue about. They hardly give us time to think about them for a while... and bug them as to when it’s coming out . Life is rough, though the Dragonfly wharnie is pretty cool. Costed me $133.00 Canadian. I hope I like it. Do you feel like that’s a good price? I think it’s absolutey fair for what I’m getting. Actually it is. Our dollar really is crap right now, especially compared to the pound, though. My first one came out to $140, my second came out to $135. Amazing how much the currency changes so fast. That’s quite the difference. Are you Canadian? Very nice pic. Would you mind if I use this for my phone wallpaper? 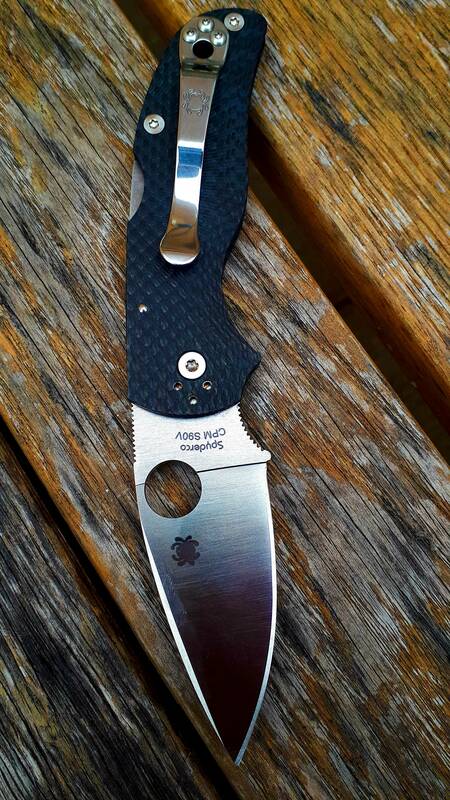 Topic: Spyderco Dice Lightweight - Who needs a Para 3 LW? Re: Spyderco Dice Lightweight - Who needs a Para 3 LW?